How would you like to eat a steaming, spicy hot bowl of peanut butter for breakfast? Okay, let me tell you something that I did not mention on the blog just yet, but I have mentioned in my comments on other blogs: I actually had to abstain from peanut butter for a week. Yes…for a WEEK. I also made sure to avoid other peanut products as much as possible during that same time, but peanut butter was the biggest culprit. Here’s why: peanuts are one of the most heavily-contaminated crops in the commercial food industry, so many packaged peanut products–even conventional peanuts in bulk–may contain some molds, trans-fats or GMOs that wreak havoc to the digestive and immune system. But say you get organic, non-GMO and trans-fat free peanuts or peanut butter, which is what I always try to do. You’ve saved yourself from one part of the spectrum, but what about peanuts themselves? It’s true that peanuts contain a decent amount of protein and a healthy amount of monounsaturated fats, but they also have a very generous amount of omega-6 fatty acids, which if consumed in excess, can lead to heart disease and inflammation. As a legume, peanuts also contain a high amount of lectins, which bind to cell membranes and are often foreign to our bodies, hence why we often experience bloating, sickness and digestion problems when we consume too many beans and dairy. This all explained why I experienced bloating, stomach issues, lethargy and other health problems every night after my dessert of dark chocolate and peanut butter! I won’t be going into details because this story would take forever to write, and I could complain on and on about the agony of both the cravings for peanut butter and the symptoms I dealt with after giving into them and feeling horrible about myself afterwards. If you want to read more about my story with how I had to avoid peanuts for a week and how I was able to start eating it again, do remind me in the comment section below–well, AFTER you read this recipe, of course! Eating peanuts again didn’t feel like I was finally released from diet jail. 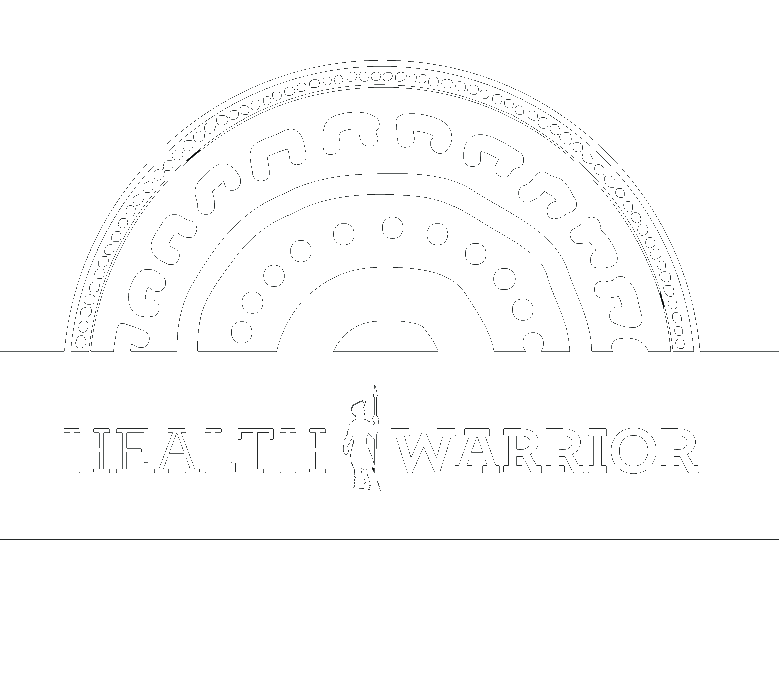 I didn’t binge like crazy, and I experienced no inflammation symptoms after my first spoonful. It felt really good to eat peanuts comfortably again, and I didn’t have any lingering fears of them after everything was normal. As of now, I just don’t have peanuts or peanut butter every single day or even every other day. I’ve really learned to listen to my body and just not eat nut butters out of routine, but eat them because I genuinely want to taste them. The moral of the story is everything in moderation and everything in variety. I’ve learned to embrace hazelnut butter and even homemade walnut butter as amazing alternatives to my peanut butter addiction. Of course, I am NOT saying that peanuts and peanut butter are bad for you, because they really are not. What I’m saying is that you have to be careful with all foods in terms of where you purchase them, how they are processed in the food markets, and how much you eat of them. I’ll still gladly have peanut butter and peanuts if I feel like it. Why else would I be presenting this curry to you as a healthy and nutritious meal in the first place? Anyhow, let’s talk about this curry right now because I’m getting way too excited just by staring at it as I type everything down. Normally, peanut curry looks like the Thai curries or peanut sauces that are much thinner in consistency and redder in color. However, I would much prefer digging into a thick peanut butter stew than having to drink peanut butter. Know what I mean? So, I went with the classic cauliflower base from my past curry concoctions and practically spent days researching the perfect seasonings for this recipe. I saw that some recipes called for all of these artificial sugars, white flours, weird thickeners and sauces like ketchup, which are all why peanut curries are fat, sodium and sugar-bombs. Luckily, with a little Pinspiration, I was able to find much healthier alternatives to peanut curries and stews, and out of those recipes, I have created my own that can be eaten completely guilt-free. I used PB2 to reduce the fat content of the curry and it worked surprisingly superbly by maintaining a strong peanut flavor! 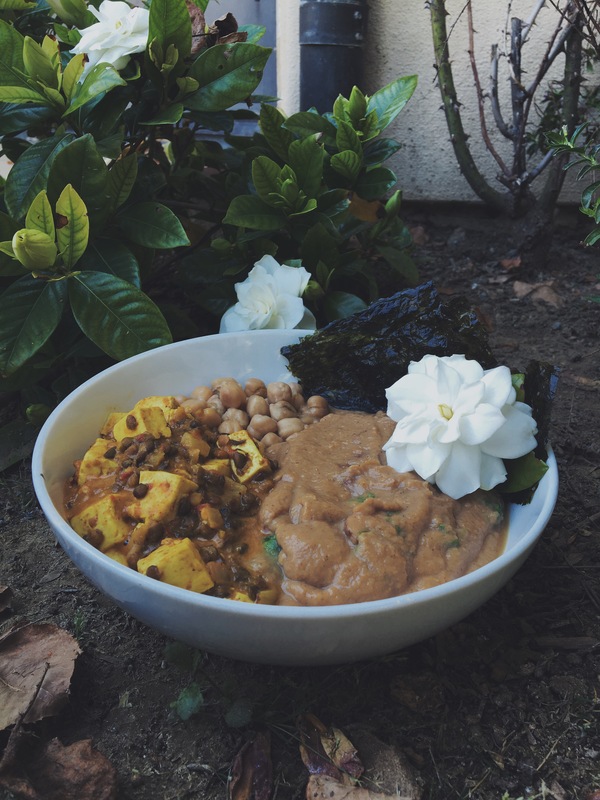 In the picture is the whole serving of the curry recipe with a side of chickpeas, my mother’s tofu and lentil curry over Romaine (unseen), a white flower for decoration and three mini Nori sheets. You can pretty much combine this curry with anything from brown/black rice, zucchini noodles, Roti, tofu, tempeh, or meat or seafood if you eat them, but it tasted so delicious this way! Opt: sweet potatoes, bell peppers, eggplant, basil, chiles, pumpkin, broccoli, cauliflower, chickpeas, etc. Blend the cauliflower, garlic clove, powdered peanut butter, cinnamon, soyaki/tamari, cayenne and seasonings in a food processor until smooth and creamy. If necessary, add water or vegetable broth. Heat a nonstick pot on medium-high heat. Pour the curry sauce into the pot. Stir in water or vegetable broth to the desired thickness. Add more powdered peanut butter, soyaki/tamari, spices and seasoning if desired. Mix in the chopped mushrooms evenly. Repeat step 6 with arugula until the greens have wilted. Continue to stir in more powdered peanut butter, soyaki/tamari, spices and seasonings. Let the curry sauce simmer on very low heat for 5-6 minutes. Ever had to abstain from a certain type of food because of sensitivities? How or did you ever incorporate it back into your diet? This recipe looks so good! Anything peanut butter is amazing. But I loved what you discussed about the effects peanut butter can have on the body if they aren’t organic / non-gmo. I too am finding so many foods that if they aren’t grown organically, I feel similar effects and having trouble with fatigue! love using peanut flour in savory sauces and stirfrys! also love the food info you gave here about peanuts, because it’s true that a lot of people don’t react well to them because of them being a legume and not a true nut!